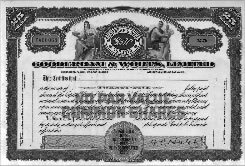 Harry C. Hatch and partners purchased Gooderham & Worts 1923. The stock certificate displayed here probably dates from 1924. Harry C. Hatch, avec ses partenaires, fit l’acquisition de Gooderham &Worts en 1923. Le certificat d’actions reproduit ici date probablement de 1924.